In System>Configuration>CRM>Sales Pipeline>Leads, you can you can you can define a number of opportunity-related options to be applied to the OroCRM instance. Here, you can enable opportunities as a feature by ticking Enable Opportunity. 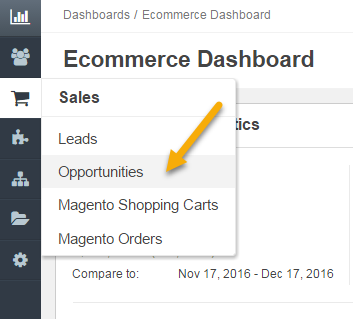 When enabled, Opportunities will appear in the Sales section of the main menu. Manage opportunity statuses and assign default probabilities to them, except for system statuses Closed Won and Closed Lost. Add a new opportunity status by clicking +Add. If Display Relevant Opportunities is enabled, the list of other opportunities related to the same account will be displayed at the opportunity view to give the sales rep quick access to deal history.